When Alice Aiken made her way back to Dalhousie University in 2016, she was returning to familiar turf. While she grew up in Ottawa, the youngest of six children to immigrant parents, she completed a Bachelor of Science in Physiotherapy at Dal in 1994. “The Royal Canadian Navy sent me,” she says of her first Dal experience as a student. She’d joined the military before starting her first science degree at University of Ottawa in 1984, served from 1984 until 1998, and was posted in Halifax as a ship’s navigator. That military experience helped inspire her academic research, which focuses on health services and policies for military personnel, Veterans and their families. After leaving the Forces, Dr. Aiken spent 18 years with the School of Rehabilitation Therapy at Queen’s University, first managing their physiotherapy clinic and being a clinical teacher full time, while she did her master’s and PhD degrees part time. She later became a faculty member, and built a pan-Canadian research network focused on military and Veteran health research from the ground up. 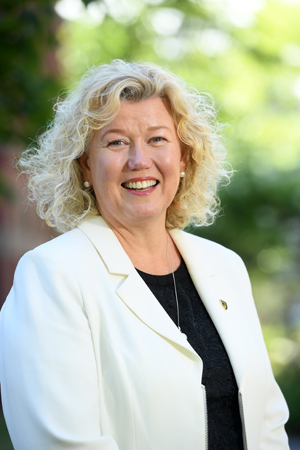 Returning to Dal in 2016, in a leadership position this time as Dean of the Faculty of Health, she found constant reminders that the university’s researchers aren’t motivated just by their own ambitions or research goals, but by the desire to do good for the entire region. It was really great to come back 22 years later. I had been away long enough that I’d forgotten the collaborative spirit of the East Coast and Dalhousie. That’s our greatest strength. 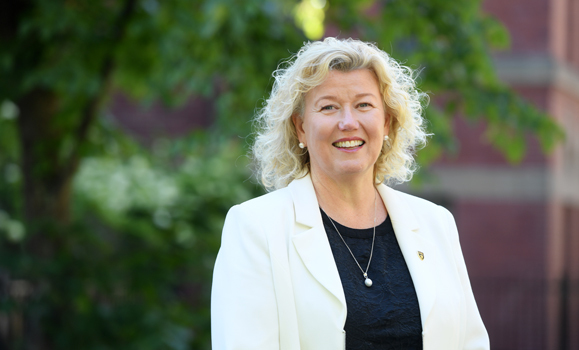 She now brings that collaborative spirit into her work as vice-president, research & innovation (VPRI), and it’s been central in the development of the university’s new research and innovation strategic direction — fittingly named Impact Together. It’s designed to ensure Dal continues to grow research and innovation on campus and be a vibrant part of the U15 Group of Canadian research universities. Her role as VPRI requires managing many partnerships with stakeholders in the private and public sectors. And it means finding ways to empower students and faculty as researchers, innovators and creators and helping them make an impact on local and global challenges — a theme that resonates, for example, within the Dal Innovates initiative. The Dal community can expect to hear more from Dr. Aiken as she works to build on Dal’s recent successes like the Ocean Frontier Institute (a $220-million international research collaboration) in fields like health care — through the Integrated Health Research and Innovation Strategy (IHRIS), a province-wide research and innovation strategy currently under development with the health authorites, government, industry and the public. Gross Anatomy at Dalhousie. I loved it. Dr. Bob Clattenburg was the professor — he made it fun because he was so passionate about the subject. Tom Waits or Diana Krall. One of my mentors said to me, “Imagine how much we would all accomplish if nobody needed to take the credit.” Work for the team. Dr. Duncan Sinclair, Former Dean of Medicine at Queen’s. Freddie Mercury. I love Queen’s music and I think he was a genius. His old videos in the late ‘70s and ‘80s show he was bending gender stereotypes ahead of his time.